Captions: (upper left) Bald Man. ; (lower left) Weitas Meadows. You can find me on the ridgeline above you. I’ve seen many pass this way, some in joy and some in sadness, some in peace and some in war. For the Nimiipuu (Nez Perce) I was K’useyneisskit or ‘road to the buffalo.’ For the Selish (Salish) I was Nap-to-nee-sha or ‘road to the salmon.’ For Lewis and Clark, this “. . . Indian road . . .” led them across “. . . the most horrible mountains.” From earliest times people have traveled across my back from the rivers of the west to the plains of the east, down my arms from high mountains gathering areas to fishing grounds. I was a key link in a vast trade network carrying buffalo, salmon, shells and bows from ocean to ocean. In more recent times visitors have scratched for gold, cleared trails and built roads across me. 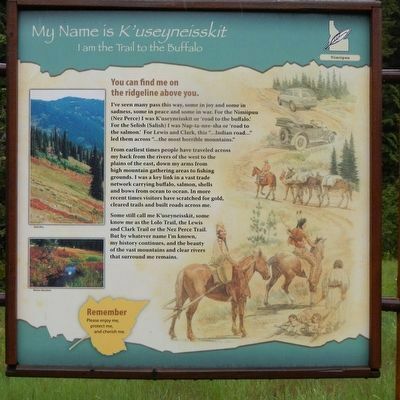 Some still call me K’useyneisskit, some know me as the Lolo Trail, the Lewis and Clark Trail or the Nez Perce Trail. But by whatever name I’m known, my history continues, and the beauty of the vast mountains and clear rivers that surround me remains. The marker is at the right. 46° 27.036′ N, 115° 5.04′ W. Marker is near Kooskia, Idaho, in Idaho County. Marker is on U.S. 12 at milepost 140 near Gravey Creek/Saddle Camp Road (Forest Road 107), on the right when traveling west. Touch for map. 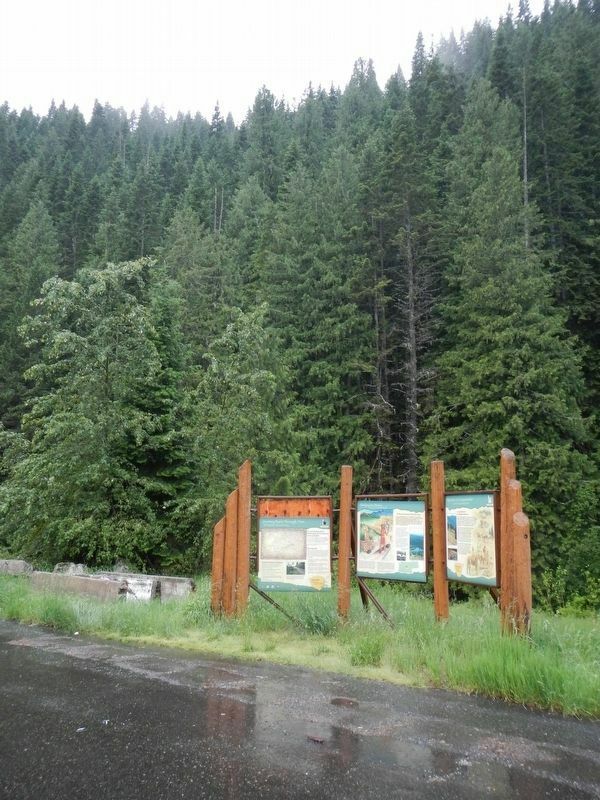 Marker is in this post office area: Kooskia ID 83539, United States of America. Touch for directions. Other nearby markers. At least 2 other markers are within 7 miles of this marker, measured as the crow flies. Nimiipuum Wetes (here, next to this marker); Welcome to Colgate Licks (approx. 6.9 miles away). More. Search the internet for My Name is K'useynisskit. Credits. This page was last revised on September 11, 2018. This page originally submitted on September 11, 2018, by Barry Swackhamer of San Jose, California. This page has been viewed 40 times since then and 5 times this year. Photos: 1, 2. submitted on September 11, 2018, by Barry Swackhamer of San Jose, California.